This model is of the scale that Anubis would use to weigh the hearts of souls to determine whether they would be allowed to go on to the field of reeds (paradise). I made this for a project about a trip through the ancient Egyptian afterlife, Duat. The model is used in realtime VR, so I tried to be careful about where I was spending my polygons. It is worth noting that while I textured the model below for this render, I was not the texture artist on this team, so the textures presented below are not representative of the final textures used in the production. 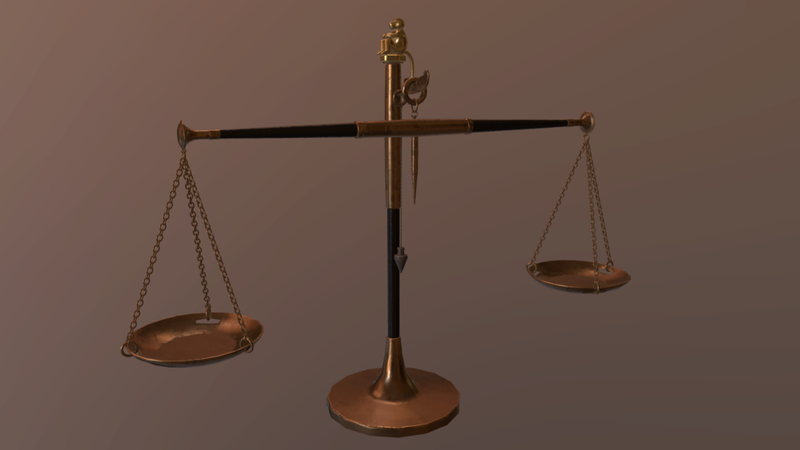 Since I had never seen an ancient balance scale before, I had to do some research to find out how they would work in order to make my prop believable. I some versions of hieroglyphics, the figurine atop the scale was of Ma'at (a human) whereas in others it was of Thoth in his baboon form. My team voted to use Thoth, so that is why I went with that version. Here are some references I based my design off of. After figuring out how the mechanism of the balance scale worked and how the beam was suspended, I came up with this model, based in part on the diagram from the hieroglyphs, and in part from texts that described how these were made/used in ancient Egypt. For this render, I used Substance Painter to quickly put together some materials for the models. UV inspection and wireframe views are available in the Sketchfab viewer below.